The Edelstam Prize 2018 is awarded to Mrs. Li Wenzu from China for outstanding contributions and exceptional courage in standing up for one’s beliefs in the Defence of Human Rights. The prize will be awarded during a ceremony at the House of Nobility in Stockholm, Sweden, later today, November 27, 2018. Unfortunately, the laureate, Mrs. Li Wenzu, cannot travel to Stockholm to receive the prize as she is not allowed to leave the country. Therefore, Mrs. Yuan Weijing, a fellow Chinese human rights activist and wife of exiled lawyer Chen Guangcheng, will receive the prize on her behalf. Mrs. Li Wenzu from the People’s Republic of China is the wife of the Chinese human rights lawyer Wang Quanzhang, who has defended activists, victims of land seizures and religious minorities. In 2015 he disappeared during the “709 Crackdown,” a police sweep targeting courtroom critics of the Communist authorities. Since then, Li Wenzu has been instrumental in campaigning for the release of the hundreds of lawyers and activists detained during the crackdown. “The attention that Mrs. Li Wenzu and the other wives have brought, not only to their husbands’ plight, but also to the state of the crackdown, is a wonderful example of courageous human rights activism, fighting back with untraditional methods, using online appeals, and visits to jails, prosecutors and courts. China remains an authoritarian one-party state that systematically curtails a wide range of fundamental human rights, including the freedom of expression, association and assembly, and using a system of enforced disappearances,” says Caroline Edelstam, Chair of the Edelstam Prize Jury and co-founder of the Edelstam Foundation. Li Wenzu and Wang Qiaoling (the wife of human rights lawyer Li Heping) were the first members of what has later become known as the “709 Family.” They have actively looked for families of those affected by the “709 Crackdown,” trying to understand their needs and supporting them in every possible manner. In order to do so, they have travelled the length and breadth of the country, and have even been arrested at times for visiting “sensitive” family members. Their efforts have gained the trust of the family members of other detained human rights lawyers, and they have gradually managed to mobilize them into action. Mrs. Li Wenzu has played an outstanding and crucial role in the “709 Family,” in providing creative campaigns and contributing to shaping the group’s characteristic activism. She is the one who holds together the group with her good humour and positive energy. The “709 Family” has further engaged in lobbying international leaders and diplomats, and courageously spoken up to the authorities not only regarding their own cases, but also on the human rights situation in general in China. By doing so, Mrs. Li Wenzu and other members of the “709 Family,” even their parents and children, have come under intense pressure from the authorities. “It is important to find ways to enforce national and international law and promoting accountability for serious abuses of human rights. Where violations have occurred, states must be held accountable. Also, the international community has a responsibility for establishing justice, ensuring the protection of victims, and upholding the principle that nobody is above the law. Enforced disappearances are grave human rights violations. They are criminal acts, without exception and regardless of circumstance, including state of war, emergency or national security. According to international law, family members of the disappeared are recognized as victims of enforced disappearance as well,” says Caroline Edelstam, Chair of the Edelstam Prize Jury. Mrs. Li Wenzu is a Chinese citizen. Until the day of her husband’s arrest in July 2015, she led the ordinary life of a Chinese middleclass housewife, caring for the couple’s only child. Li Wenzu could have accepted the situation, and simply waited for her husband to be released, or could have a sought an individual resolution for her personal situation and of her husband’s case. Instead, in spite of the dangerous and hostile political environment, with outstanding courage, braving the risks and overcoming her suffering, Li Wenzu chose to become an activist herself, and organized with other fearless housewives the “709 Family” group, looking for and organizing the families of the 300 plus human rights lawyers arrested during the “709 Crackdown”, supporting them, and mobilizing them into action. This solidarity and mobilization of the families has proven crucial. They have filed lawsuits against the Public Security Bureau, and tirelessly and creatively lobbied and campaigned for the release of the detained lawyers and other activists. Li Wenzu organized the non-violent “Red Bucket Protest” and “Long March for Freedom” to raise the general awareness of the persecution of lawyers and other human rights activists who are opposed to China’s authoritarian regime. As a result of their actions of Li Wenzu and her fellow family members, most of the arrested lawyers have now been released, while 14 of them have been brought to trial and sentenced to prison terms. Mr. Wang Quanzhang, Li Wenzu’s husband, is the only detainee still disappeared since his arrest and disappearance three years ago. 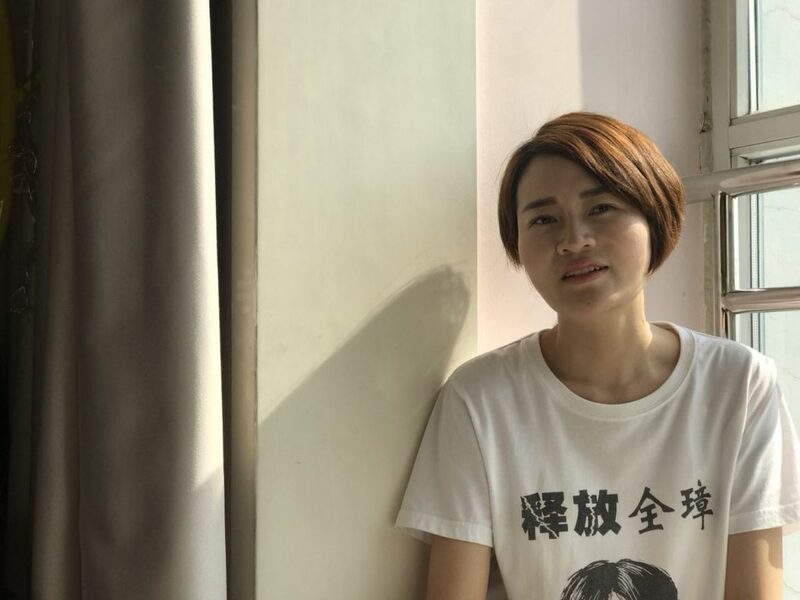 Li Wenzu has gone on fighting despite being subjected to constant harassment threats and repeated arrests by the authorities, and her child had been expelled from school. She has continued advocating, beyond her personal interest, for the principles of rule of law and democracy in China, and campaigned not only for her husband’s release, but also for the freedom of all the victims of violations of human rights in China. She has not given up and is currently under siege in her own house for these reasons. The Edelstam Prize is a Sweden-based international monetary award, administrated by the Harald Edelstam Foundation. The Edelstam Prize is awarded for outstanding contributions and exceptional courage in standing up for one’s beliefs in the Defence of Human Rights. The Edelstam Prize is named after, and awarded in the memory of, the Swedish diplomat and Ambassador, Harald Edelstam (1913-1989). Harald Edelstam distinguished himself as diplomat by his professional competence, his bravery and his civic courage in the fight for Human Rights. He was an early proponent and symbol of what is today known as the ”Responsibility to Protect,” and his memorable acts contributed to save more than a thousand lives. The winner of the Edelstam Prize can be a private person or a person who serves in Government, international or national organisations. The winner shall be an individual who has acted in Ambassador Harald Edelstam’s spirit in a country/countries where Human Rights, according to international law, have been violated. The laureate must have shown outstanding capabilities in analysing and handling complex situations and in finding ways, even unconventional and creative ones, to defend Human Rights. The candidate has, presumably in a complex situation, been able to take a decisive role in helping threatened people or directly saving human lives. Civic courage is a central parameter in the selection of the successful candidate. The international jury is chaired by Ms. Caroline Edelstam, Harald Edelstam’s granddaughter and co-founder of the Edelstam Foundation. The 2003 Nobel Peace Prize Laureate, Judge Shirin Ebadi represents Asia; Africa is represented by Dr. Pascoal Mocumbi, former Prime Minister of Mozambique. Ambassador Eileen Donahoe, Executive Director of Global Digital Policy Incubator at Stanford University’s Center for Democracy, Development and the Rule of Law and former US Ambassador to UN Human Rights Council represents North America. Professor Philip Alston, UN Special Rapporteur on extreme poverty and human rights, represents Oceania. Latin America is represented by former Chief Prosecutor of the International Criminal Court (ICC), Dr. Luis Moreno-Ocampo, and Europe is represented by former Judge Baltasar Garzón, who served on Spain’s central criminal court, who is known for having indicted the Chilean dictator, General Augusto Pinochet for the deaths and torture of thousands of victims from Chile and other countries.